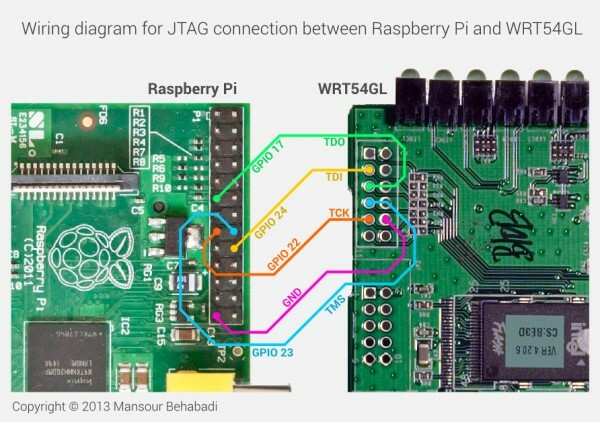 Debrick WRT54GL using Raspberry Pi (JTAG bit banging) @Raspberry_Pi #piday #raspberrypi « Adafruit Industries – Makers, hackers, artists, designers and engineers! I remember using WRT54G router when it first came more than a decade ago and back then, my first attempt to upgrade the firmware resulted in bricking it. It wasn’t until I went searching for how to make it OK again that I discovered an entire community of hackers making this $100 device do incredible and magical things. Fast forward to few days ago and while going through my stuff, I came across this Samsung HDD which had a very familiar looking chip on it—an SDRAM! Aha! I remembered I had seen that chip elsewhere, on my very own WRT54GL. I quickly googled the part numbers and found them to be pin compatible. So I rolled up my sleeves and got busy desoldering the chip off the HDD and soldering it onto the router.